I was recently on a mission trip in Uganda, working with a school that badly needed a girls dormitory, since the 150 or so girls at the school were sleeping in bunk beds in a packed classroom. None of us on the team were skilled masons (we weren’t really skilled anything, to be honest), so we spent most of our time moving bricks. Moving bricks is about as much fun as you might imagine, which is to say that it ranks somewhere between waiting in line at the DMV and having a tooth pulled. The local way of moving bricks is that you form a line, I guess you call it a fireman’s brigade, and toss bricks, one a time, down the line. Once the brick reaches the end of the line, you stack it there. By the end of the week, I noticed that we were really moving bricks to one spot and then moving them back, probably just to keep us busy. But it was pleasant work, working together and visiting with one another and with the local children. One day of our trip was a national holiday, so there was no class. 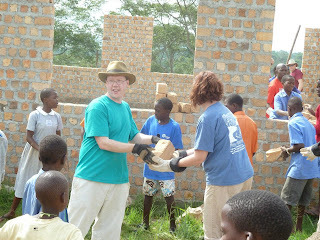 The teachers came to help us move bricks, and the children followed. Because they stood to benefit from the building of the dorm, they wanted to help in whatever small way they could. So the children and teachers intermingled with the mission team, and for an hour or so the Kingdom of God was present on earth, passing those bricks, one after another, learning each other’s work songs, laughing and working together, tossing bricks down the line. I got so caught up in the work and the laughing that I almost didn’t notice that behind us, in a smaller line, there stood a group of small children, too young to pass the heavy bricks, but wanting to help. These small children found a small pile of stones, pebbles, really, and they stood behind us, lined up, about 10 of them, the first one taking a pebble from the pile, passing it along, passing it down, until they reached the end of the line. Once the children reached the end of the line, the last child placed the pebbles in a small pile. It was right behind me, and I almost missed it, this sweet scene, this vision of the kingdom of God. Because the children were too small to help us pass larger bricks, they found another way to help. I almost missed it. And yet, thank goodness and thank God, I noticed. Question: What small ways have you noticed God working in your life lately?